Do you remember when you were in school, probably in junior high or high school, and sometimes you'd rush through an assignment without giving it much effort? Maybe you forgot about it until the period before, or maybe you just didn't care about it all that much. And when your teacher would hand it back to you with a grade on it, there would also be a note written in the margin in red pen (or green, if you had Ms. Whittington at Lubbock High School) that read, "I know you're capable of much more than this." Or that most bemusing of parental rebukes, "I'm not angry with you. I'm just very disappointed." After watching Bruiser, I want to write that note to George Romero in the margin, and I want to tell him that I'm not angry with him, just very disappointed. I'll admit to being drawn to this movie in part because of its cover. The blank face staring out at me made me think of Michael Myers in the Halloween movies. More than a horror movie, though, this was sort of a revenge thriller. The main character is Henry Creedlow, a corporate nobody who works for a popular men's magazine. His boss abuses him, his wife is cheating on him (with the boss), his housekeeper steals from him, and his financial advisor (who is also his oldest and closest friend) is in cahoots with his wife to rob him blind. Henry is pretty much a doormat, the textbook example of the saying "nice guys finish last." After things come to a head during a party at his boss's house, Henry wakes up the next morning to find that his face has been replaced by a featureless white mask. He's swallowed his pride and dignity for so long that it's finally cost him his own identity, and now that he's a man without a face, he sets about righting the wrongs in his life. 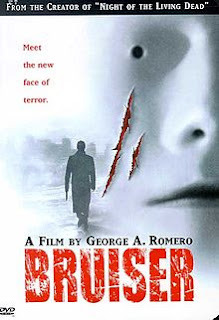 That said, even as a revenge movie, Bruiser just isn't very good. Peter Stormare plays the abusive boss almost like a cartoon character. Everybody who has wronged Henry is just impossibly despicable, and he's just impossibly wishy-washy until his transformation, when he inexplicably turns impossibly badass and crazed. The movie makes this big allegorical leap about him losing his identity by laying down to the whims of others for so long, and it could be an interesting path to explore, except that pretty much everybody who knew him before he changed is still able to recognize him almost instantly after the change. What's the point of removing the dude's identity if everybody is still completely aware of his identity? And the very last scene pretty much breaks the movie's own logic - Henry has his face back and is at a new job with a new abusive boss, and when he wheels around to defend himself, his face is blank again. So, does he lose the face when he has to swallow the world's insults, or does he lose it whenever he needs to go into vengeance mode? Because the two things are kind of mutually exclusive. George, you know how much I think of you, and I hope you feel like we can still talk about anything, but I have to leave a disappointed red note in the margin of this movie. I give it one blank face out of five.